White gold is classically elegant. Due to a ban of platinum use for non-military manufacturing during World War II, white gold engagement rings increased in popularity. Prior to that time, platinum had been the more popular choice for rings in the United States. White gold is an alloy made by adding metals such as nickel, palladium, and silver to pure gold. White gold may also be plated with rhodium to achieve a pale luminescence. The rhodium coating, however, eventually wears away and must be replaced every one to five years to maintain a brilliant white color. This process typically costs under $50 depending on the style and intricacy of the ring. Like yellow gold, white gold is measured in karats. Popular markings are 18K, 14K, and 9K, and the quality stamp is found inside the ring band. Eighteen-karat white gold is a mix of 75% pure gold and 25% white metal, usually palladium or nickel. Nine-karat white gold is a mixture of three parts gold to five parts silver or another alloy metal. While white gold is not as durable or strong as platinum, it still has several advantages. The first consideration is its lower price, allowing couples to invest more of their money in better quality diamonds, other gemstones, or more elaborate ring styles rather than the base metal that forms the band. A white gold wedding band can cost as little as one-fourth the price of a platinum ring or another more expensive metal. Couples should not forget the necessity of periodically refinishing the ring, however, when calculating the ring's cost. White gold is also lighter in weight than platinum and is stronger and more durable than most pure or yellow gold. White gold is also more scratch resistant, allowing the ring to maintain a flawless appearance under more strenuous activities. For many women, white gold is a more versatile metal than yellow gold. It can be worn with nearly any other piece of jewelry without causing a fashion faux pas, and its simplistic elegance matches any outfit flawlessly. Furthermore, white gold more easily highlights the brilliance of diamonds, whereas yellow gold may create the illusion of a yellowish tint on some styles. No type of metal is perfect, and white gold does have potential problems that couples must consider when selecting white gold engagement rings. Buyers of white gold engagement rings should be aware of the potential allergy posed by nickel, a metal commonly alloyed with white gold. It is estimated that at least 20% of the population is allergic to nickel, and symptoms include swelling, discoloration, and itching where skin contacts the metal. If nickel allergies are a concern, palladium white gold is a good but slightly more expensive alternative. No grade of gold, including white gold, should be worn in hot tubs or swimming pools because of its sensitivity to chlorine. It may cause pitting, discoloration, or dissolution of the metal. White gold jewelry should also be removed when using any harsh household cleaner or bleach. One detriment to white gold that many couples do not immediately consider is the fact that people often will not recognize it for the quality metal that it is. 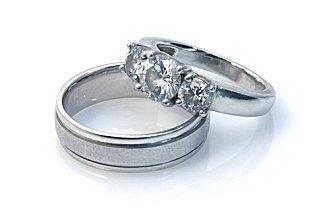 Instead, casual observers may assume a white gold engagement ring is actually silver or sterling silver. 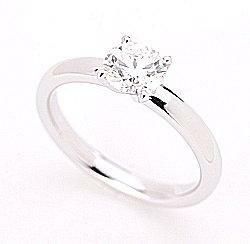 White gold is steadily increasing in popularity for engagement rings. It is an elegant, versatile metal that can be used to create unique and beautiful jewelry, and with proper care, a white gold engagement ring is sure to become a treasured heirloom.